Day 2, first day of climbing. We had a slow morning (like we kid ourselves any morning will be quicker) opened with fresh grapefruit, fried eggs on nice toast and lots of coffee before heading to our first climbing area of the holiday. Jim and Lolly suggested we all meet up at La Ségognole which turned out to be a few minutes up the road from our gite. I’d never been here before as it wasn’t in any of the books that I owned so I’ve no idea what to expect. 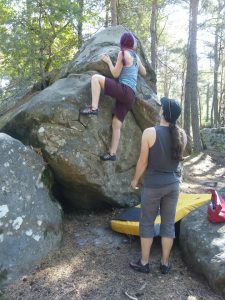 It turned out to be a lovely shady bit of forest with lots of medium sized boulders to play on with a yellow, orange and red circuit which was a pretty much perfect mix of difficulties. 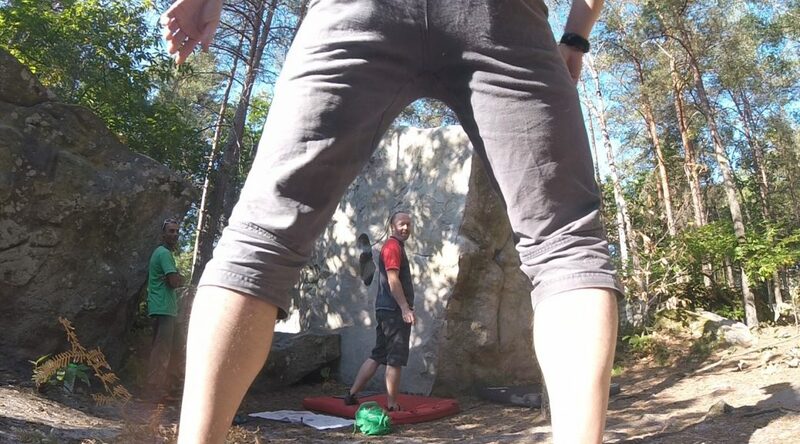 I didn’t really stick to any circuit in particular, instead just climb what seemed fun. Happily, I got up 3 red climbs this time, which seems a little upgrade on previous holidays on the first day. I’m rather happy with how I was climbing generally because i seemed to be doing a lot more good footwork and plenty of mantles to finish which really seems out of character!